If you live in a city with a mass transit system as sprawling as that of New York City, then you know that all sorts of things can screw up service (weather, passengers holding the doors, disembodied human heads), but has the reason ever been this cute? 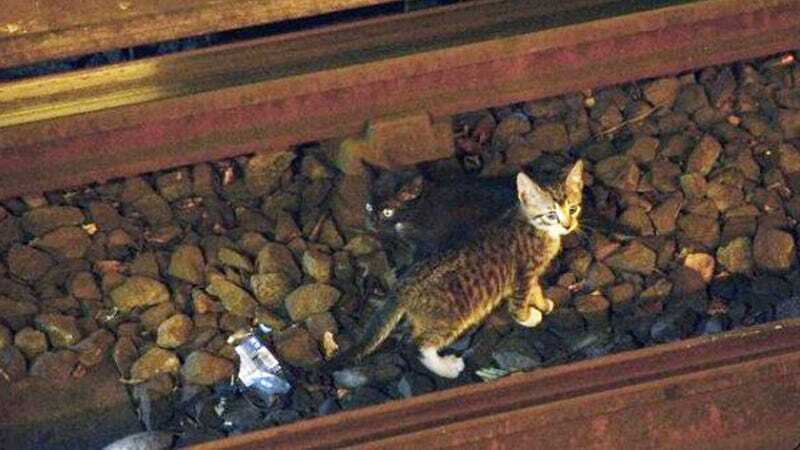 Late Thursday morning, the Metropolitan Transit Authority was forced to suspend service at the Church Avenue subway station in Brooklyn after a cat owner reported that two kittens had somehow gotten loose on the tracks. After nearly two hours of searching, MTA employees were forced to give up and resume service, but not before warning conductors "to proceed with caution in the area where the cats were last seen." The cats were finally found (very much alive!) around 6:30pm on the tracks north of Church Avenue. There are some reports that the kittens are now available for adoption. Please celebrate/enjoy the rest of your day by singing "Stop dat train for kiiiiiittens" to the tune of Bob Marley and the Wailers' "Stop That Train." You're welcome. You're very welcome.